Is there a relationship between absentmindness and creativity? On a recent Friday night, my mind lit out for home and freedom quite a bit before my body managed to make it out of the office. My thoughts were revolving around a conversation about history and ghosts at the end of the work day with one of my esteemed collaborators. I made it all the way to the bus stop before I realized I had left my wallet and Blackberry behind. Back to the office I trudged, in the pouring rain. By the time I managed to finally squeeze on to a packed bus, it was past 7. I was immediately distracted by the landscape of the buildings and people surrounded by raindrops, many of them scurrying into Mme. 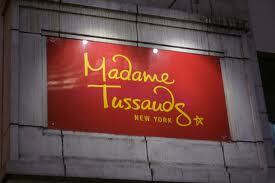 Tussaud’s (a very appropriate place for ghosts and history). Of course, I left my umbrella on the bus. If I hadn’t been distracted, I would have walked in my front door at least an hour and a half earlier and a great deal dryer. I don’t know about you, but this isn’t all that unusual for me. In the middle of necessary daily activities, my mind is often somewhere else, very likely turning what I’m seeing or doing into a scene or story of some kind. I construct elaborate back stories for strangers (the woman opening a chocolate bar next to me on the bus; the sales clerk at Rite Aid; the barista at Starbucks). 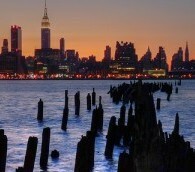 I sink my Manhattan landscape into the Hudson River and envision what the rest of the city would look like. I have a glimpse of an underground tunnel and instantly the city is connected not just by subways but secret passageways. I am struck by lyrics to a song that hasn’t yet been written while prowling the sales racks at Macy’s. In consequence, I usually live in a mild state of distraction. This doesn’t happen when I am sitting down one on one with another human being, or when I am actually working on something that interests me, but when I am in a group activity that doesn’t completely catch my interest, or doing the things we usually do by habit—commuting, shopping, cooking. Half my creative thinking is done in these intervals of absentmindedness. (The other half seems to be done when I’m falling asleep or waking up, but that’s another post for another time.) Although I am not paying attention to the external world, I am completely absorbed in my internal one, and the thoughts and images that come to me while I am barely avoiding walking into open manholes stay with me when I finally make it home and sit down to write. This state of absentmindedness may be why creative people often say, when interviewed—I do my writing or painting or filmmaking or composing because I couldn’t do anything else. It can be a bit of a challenge operating in the workaday world when much of your mind is in another place entirely. But all of us have to operate in both worlds to some extent, and, after all, one feeds the other. The people in your life who value you will learn to put up with your moments of abstraction, and if you are lucky, the people you manage not to run into on the street will pull you out of the path of any oncoming buses. Our minds, after all, are only absent from this particular moment and place—they are completely present somewhere else, exploring and building worlds and stories and images and melodies. It might make you late to dinner once in a while, but in the long run, being absent minded is often just part of being creative. And, if there is somewhere you really, really need to be, you will just have to join the real world for a little while, knowing that the other world is always there, awaiting your return. Copyright 2012 Deborah Atherton. All rights reserved.